Elspeth Eric is known for playing gun molls on many old time radio programs in the 40s-50s. She appeared in 13 CBS Radio Mystery Theater episodes and wrote over 100 episodes. I almost got to the point where I would skip any Elspeth Eric episode, but every now and then I am surprised and actually enjoy her work. Now I listen to the nine horrible episodes to get to that one gem she eventually produced. 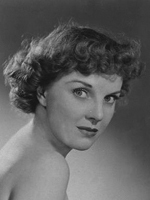 Elspeth Eric was one of the most multi-talented actress-writer-director and producer of radio drama from the 1940s through the early 1980s. Simply, Elspeth Eric broke the mold. I first heard Ms. Eric playing stereotype dumb-blond gun-molls on Gangbusters in the 1940s. She could re-shape her voice like Silly Putty. Elspeth could sound completely different depending upon script requirements. Elspeth never seriously tried to get into the movies or T.V. as she was forever enamoured with radio. After all radio offers your imagination the most room to wander. Radio drama can be said to lack tangible limits of T.V. and movies. Elspeth Eric moved naturally from character actress to lead roles, to writing , directing and producing. I don;t believe she ever saw limitations to radio. Her catalogue of work is more prolific than Johnny Mercer's massive song list! In a long era that did not ordinarily allow young women to direct, much less produce, Elspeth Eric proved the stereotypes wrong and has more major credits to her name than almost any other radio personality. I began to notice her name on more radio credits and soon she became my favourite radio professional. ANYTHING that Elspeth Eric wrote, directed, produced or acted in, is worth a listen. Ms. Eric was probably the most undiscovered and under-rated radio actor in the world. Enjoy the legacy that is Elspeth Eric. I'm with Brody. It's almost a shame that she occasionally is very clever, because her bad episodes are gratingly bad and it would be easier to just skip her with confidence. Sometimes she just *tells* you what she's doing, emptying her bag of whatever cheap paranormal activity, phenomenon, and abilities she recently read about and seeing what sticks in the story. She wrote over a hundred CBSRMT episodes and appeared in over a dozen. Her stories are often recognizable by their emphasis in the psychological tension in the story. Almost a signature style that separated Mystery Theater from the previous generation of radio dramas. She also tended to write more stories than her fellow CBSRMT writers where a woman was the lead character. Ha! I named my car after her. Nine times out of 10, (but closer to 10 times out of 10), usually the episodes that hold my ear, strongest or get the most repeat listening, are in hindsight Ms. Eric's offerings. Her way with words—and even more interestingly her spoken words as a sometimes radio talent—truly separated her from her CBSRMT peers. Like a Serling, Poe, Barker or Lovecraft, Eric’s signature style blended equal parts strange and quirky with a hint of disturbing thrown in for good measure. I would have loved to put a next drink of hers on my tab in a bribe to talk to her a little about her craft. Anybody have a time machine handy? I respect the personal opinions here because they share a love for this exceptional product for the time period, I accept their take on the writers and actors and I too have writers that I'm not a fan of. In this case I have to go with my take on the talent of Elspeth Eric. Whether or not she was exceptional at writing she was exceptional at being prolific in the sheer numbers of episodes she wrote that were produced here. That says a lot about about the confidence that Himan Brown showed for her. Himself, who directed and produced some of the legends of radio, a master of production and directing that would pull these shows together at superhuman speed. The way he worked he had little time to accept a script that wouldn't fit. Here's to Elspeth Eric, a woman who more than helped to keep this series alive but to be a signature of it in her own right. It's interesting that Elspeth Eric wrote a few of my very favorite episodes, such as "The Black Room" and "Ghost At the Gate," and yet she also wrote some of the ones I hate the most, such as, "The Resident" and "The Deadly Hour." I will say that she deserves credit for being one of the most prolific, versatile writers on the show. She has the ability to write in many different styles and formats, which is also amazing. But her repeated episodes about "daddy issues" are a bit tiresome at times. The bottom line is that when she is good, she stands out as one of the best, but when she is bad, she's REALLY bad, lol! Unfortunately, she wrote fewer good ones than bad ones, imo. Elspeth Eric (September 15, 1907 - 1993) was an actress in old-time radio, "usually cast as the other woman in soaps and serials. The daughter of a doctor, Elspeth Thexton Eric was born in Chicago, Illinois. She attended Bradford Academy and graduated from Wellesley College with a double major in economics and English literature. After hearing tales of woe about "girls who had tried to crash the great White Way and failed ... she enrolled in a business school and left word with her friends in New York to let her know when a job was to be had there. She gained some acting experience in summer stock theatre and moved back to New York, where she worked at various jobs for five years while she tried to find work as an actor. During those years, "She was a switchboard operator, waitress, governess, hostess in a cocktail lounge, publicity writer, model, cook, parlor maid, social secretary to a social secretary, stenographer and book saleswoman She appeared on the some of the following readio programs Betty and Bob,The Falcon,Road of Life,The Second Mrs. Burton,The Haunting Hour, The FBI in Peace and War, Abbott Mysteries, Ever Since Eve,Front Page Farrell, Quick as a Flash,Rosemary,67 Mommie and the Men, Inner Sanctum Mystery, Bulldog Drummond, Manhattan at Midnight, Green Valley, U.S.A., Gang Busters, 21st Precinct, Grand Central Station,and Mr. District Attorney. She is my favorite of all the CBSRMT writers. That doesn't mean I think all of her episodes are brilliant; there are a few clunkers. But her experimental and philosophical style brought us many unique and memorable episodes. It's nice to see her work get more appreciation these days. When I first got into the show in the early 2000s, I felt like I was her only fan! I loved her stories. I also loved her snobby voice she could do so well. No wonder she had a *thing* about psych issues, lol! Her father was a doctor! That explains a lot for me, lol!